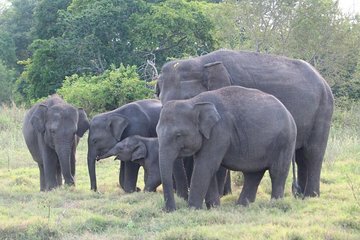 Look for Sri Lankan animals and birds on a private 3-hour safari around Kaudulla National Park. Roam the trails by private 4x4 and watch for elephants, deer, and other creatures in the scrub and grasslands. Plus, scan the reservoir waters for Indian black turtles, pelicans, lesser adjutants, and other species. Select a morning or afternoon safari, and enjoy hotel pickup and drop-off for accommodation within a 3-mile (5-kilometer) radius of Kaudulla entrance. Book a morning or afternoon safari and meet your driver-guide at the Kaudulla entrance. Alternatively, if your accommodation lies within a 3-mile (5-kilometer) radius of the entrance, enjoy a pickup and transfer to the gate. Then, head inside (own expense), board your private 4x4, and set off along the unmade tracks. Consisting of forest scrub, grasslands and reservoirs, Kaudalla draws many species and is ranked an Important Bird and Biodiversity Area by BirdLife International. Look for wildlife including the elusive slender loris, sloth bear, and spotted chevrotain (deer), together with wild boar, sambar deer, and axis deer, including rare albino axis — the latter thought to frequent the park following the recent discovery of an orphaned calf here. Elephants are regular visitors, especially during evenings and September and October when they come here for water, and the reservoir waters attract fish, reptiles, and up to 150 bird species. Observe the watersides and perhaps see Indian black and flap-shelled turtles, Mozambique tilapia fish, and birds like spot-billed pelicans and lesser adjutants. Your 3-hour safari ends at the gate or with a drop-off at hotels within the 3-mile (5-kilometer) radius.